Summer is coming to an end and students everywhere are headed back to school. A new school year brings excitement about seeing friends, getting to know your teachers, and settling into new classes — but for a growing number of students, it also brings excitement about participating in a play or musical at school or heading out on a field trip to see one. The high school musical is alive and well, but the fun doesn’t stop there. More and more middle and even elementary schools are getting in on the act. This is due to the efforts of licensing companies like Rodgers and Hammerstein, Tams Whitmark, Samuel French, and Music Theatre International (MTI). MTI was the first licensing house to create an education division. In 1996, they developed the Broadway Jr. series of scripts and resources for new and classic musicals, reduced to 60 minutes in length. Since then, MTI has added 30-minute kids’ editions, making the exciting experience of producing a musical available to elementary students as well. According to Jason Cocovinis, director of marketing and promotions at MTI, more than 5 million students have been involved in more than 100,000 Broadway Jr. performances in the U.S. alone. Participating in a school musical is more than fun. At the Beacon School in Manhattan, Jo Ann Cimato’s students are responsible for most of the jobs associated with each production. “We are teaching business skills through the production and problem-solving. Every team has a budget. They want to out-budget and out-craft each other. The student marketing team does all of their own graphics and social media and they are learning a ton about how to sell a product.” Because theater is a collaborative art, students must learn to work together and appreciate the different skills each brings to the table. Want to get your local school started? Parents and teachers can visit mtishows.com to learn more about the process. For many students, their first exposure to musical theater is through a school field trip, and others go to the theatre with their families. Broadway producers are doing more each season to provide educators and families with information to enrich students’ experiences. Many shows offer study guides with contextual information and activities that are often tied to the learning standards from their classrooms. 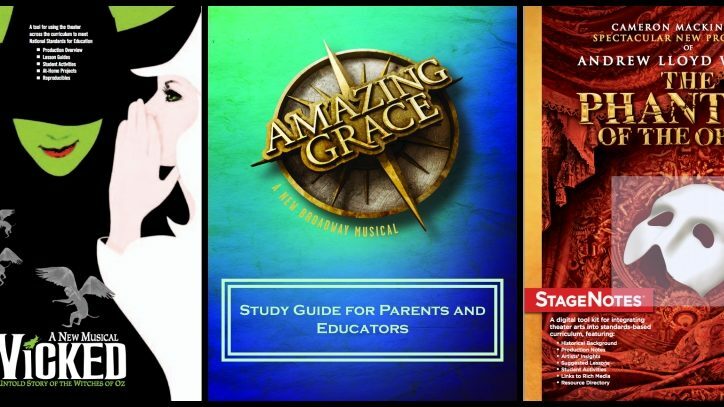 StageNotes.net is a Web resource for educators and parents and features an ever-growing library of study guides for Broadway and touring productions as well as tips for your trip to see a show. So what does this Broadway season have to offer students? Shows including Hamilton, Beautiful: The Carole King Story, Allegiance, and On Your Feet make this year a great one for storytelling. These contextually rich productions offer a chance to jump into a specific period in time and live the experiences of the characters. Choosing which one to attend can be the hardest part. “Social media has become such a big part of students’ lives that they will find shows that they want to see,” says Brian Harasek of Nederlander Patron Sales & Services. “Hamilton is very popular with student groups because Lin-Manuel Miranda is so active on Twitter.” Other hot tickets this season include Finding Neverland and the revival of Spring Awakening. The limited-engagement run of Deaf West Theatre’s Spring Awakening stars Marlee Matlin (Children of a Lesser God) and Camryn Manheim (The Practice) and incorporates American sign language into the telling of the story. But why stop at just seeing a show? If you are bringing a group, think about also booking an experiential program. The folks at Disney Theatrical are masters at this kind of event. If you are headed to Aladdin or The Lion King, they have a program that will work for you. For other shows, Camp Broadway can arrange for your students to learn more about the show or a particular theatrical discipline through a variety of experiential programs. Melissa Caolo, managing director of Camp Broadway, describes their Broadway Highlights program as a way of stepping inside the show. A cast member from the production you are seeing will teach students a number from the performance and connect your curriculum to the art form. Master classes are also offered in dance, acting, or voice, and even stage combat as well as technical areas such as wardrobe and special effects. “It opens a door to what it takes to do a show,” Caolo reports. So whatever lies ahead for you and the children in your life this school year, don’t let the months slip by without experiencing the joy and magic of theater, whether on stage or in the audience.